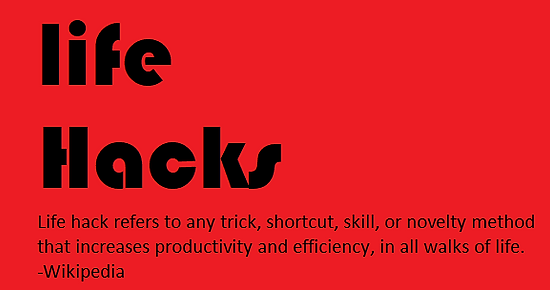 How to:10 Practical life hacks that you can do right now, “5 minutes or less” in most cases. Welcome to a new blog, my apologies for my absence from the blogging world for so many number of days, but you know how it goes, “the only thing that is certain about life is that nothing is certain”. Further, the best and worst thing about time is that “It passes away”. Disclaimer: These life hacks are given to help you guys make your everyday life easier and also provide a quick fix in case of emergencies. We do not in any shape or form encourage you to disregard the “usual” way of doing things. Also, we don`t claim that the hacks we are about to share have been invented by us and only us, so, we might find similar hacks shared by other sites / platforms as well, so, just chill and go with the flow. We`ve all been there guys, when you first get your new pair of sneakers and they are all clean and tidy, but as time goes by and you wear it more than thrice, it gets dirty but you could not care less. But suddenly, that first date comes up which you might not have planned or your friends call you for lunch and you have no time what so ever.That’s when our first life hack comes up in regards to those dirty sneakers. A piece of clothe/ towel. What you should do: Take a bit of toothpaste, Gently apply it on the base and other areas of your sneakers which are dirty. Then, take a toothbrush and rub it over the area where you applied the toothpaste and clean the toothpaste properly. Finally after this is done, clean off the sneaker with a piece of clothe/towel to end it off. The final result is a clean looking sneakers which are all ready for you to rock for your first date or casual lunch with your mates. Time required: 5 to 7 Minutes. The jeans that’s been handicapped by ugly gums. What you should do: This one is pretty simple, place your jeans on the table or any other plain surface and take an ice cube and place it over the gum for around 2 minutes and continue doing this till gum gets eliminated completely. Now, dry off using area where gum was stuck using a blow dryer and Walla!!! You can finally wear your favorite jeans. This next hack is very useful to someone like me who is guilty of leaving their keyboard (in fact entire laptop pretty dirty). Here, you are going to learn how to make use of used sticky notes to get rid of dirt off your keyboard. Simply, follow the following steps. What you should do: Take the “used sticky note” and place the sticky part of it on the edges of your laptop`s keys as shown in the picture below and move them a perpendicular line to remove the dust and other particles stuck on your keyboard. Reading this may sound complicated but it is actually quite simple, just refer the pictures below. So, this awesome hack is beneficial for everyone but especially very important for all you ladies out there.Do you ever get a doubt if some creep is on the other side of the mirror watching you while you try on an outfit inside the trial room in a mall???? Well, we`ve got you covered.All you need to do is read and follow the below mentioned steps carefully and thank us later. Any smart phone having a flashlight. The mirror you want to test. What you should do: For a two way mirror to work the light in the observation room (i.e. from where the creepy guy is watching you) must be a lot dimmer than the light in the room itself. So, turn the lights off in your room and then, turn on the flash lights of your cell phone and shine it away and downward, just above your eyes as you peer into the mirror. The observation room and possibly the creepy on the other side should be visible. Next up is a quick, cheap and really easy hack for all the dudes who want listen to their music louder but are reluctant to invest on a pair of speakers. Simply follow the following steps and subscribe to “Fromeo`s blog” if you haven’t already. (www.fromeosblog.wordpress.com). A finished Tissue paper Can. What you should do: Cut a hole on the edge of a finished tissue paper can, big enough to fit your smart phone. Insert your smart phone (smart phones having downward facing speakers would be ideal) on the hole and place on a surface like a table and now you will find that all of sudden the music coming from same phone at same volume level is much louder. Up next is the hack for all you travelers and vloggers out there. More often than not, we have to travel with our dirty laundry in our luggage either due to shortage of time or lack of amenities at the place of travel (not every place is filled with the comfort of our own home). It is at these times that this hack can save you from embarrassing situations. A Bar of scented Soap. Separate compartment in luggage for your dirty laundry. What you should do: Put all your dirty laundry in separate compartment and add a bar of scented soap on top. While this may not be a substitute for washing your clothes, this should keep you going. The next hack is going to save a lot of time for those of you who have a lot of keys and get puzzled while trying to open a lock because of a number of similar looking keys. The puzzle of keys which you want to solve. The locks belonging to those keys. What you should do: Apply the desired color of nail polish on a key and then, apply the same nail polish to the lock of the key, only thing that must be kept in mind is that, a pair of lock and key must have same colored nail polish over them so, that they match and are visually easy to identify and hence save your time. Now, this one is for all of you chips / lays lovers out there. We all know how messy our fingers get, when we eat those chips, especially when it is big sized packet and we got to dig our hand deep into the packet to get to those chips, plus it becomes kind of inconvenient and add to this, the fact that both of our hands need to be engaged just to eat some pieces of those delicious yet “not so healthy” chips. ( one hand for holding and other for picking up the chips and eating). So, this next hack is going to provide a solution to all the above mentioned problems and also gives an illusion of having more chips than there actually is in your packet. You should definitely give this a shot. What you should do: Open the packet of lays in the manner shown in picture below such that only top comes off and then, fold the bottom of the same packet in the manner below so, that the final result is a compact packet and thus, you get a visual illusion of having a lot more lays to enjoy while reading this blog. What you should do: Pour enough coke in a big jar or any other big sized vessel. Then drown the object inside the coke. Now, time for which the object should be kept drowned is not exactly fixed but we`ve found that keeping it drowned over night or full 24 hours if you`ve got that much time gives the best result. Then, take the object out and give it a quick wash. This next hack is for all the smart phone content consumers. Do you love consuming content on your smart phone??? Do you love watching YouTube videos on your phone while having breakfast or doing your Homework, but struggle getting your phone stand still??? Well, we`ve got you covered. No more adjusting your phone on the back of wall or a pile of books. What you should do: Place your sunglasses in the position shown in the first picture below. Then, place your smart phone on top of the smart phone by balancing the smart phone in a way that perfectly fits over the sunglasses. Finally go to you tube channel of your choice and enjoy your favorite videos on the go. Similarly, you can get a similar result using a paper clip as well. Try it yourself and let me know, how it went in the comments below. Previous Is Travelling a Headache or a Memory to be Cherished?? ?